This is a recording of Catherine Engelbrecht, the head of True The Vote, being interviewed on a radio station about the investigation into IRS targeting of conservative organizations. The recording is posted at YouTube. The bottom line in what Ms. Engelbrecht is saying is that neither the FBI or the Justice Department has interviewed her or anyone from True the Vote about the fact that they were targeted by the IRS. It might be a good idea to remember that when President Nixon tried to use the IRS against his enemies, the IRS told him to go pound sand. Unfortunately the organization has forgotten that its first responsibility is to the citizens of America–not the politicians. The only people making progress in the investigation of the IRS are True the Vote and Judicial Watch. That is a sad commentary on our government. There is a reason the Internal Revenue Service (IRS) targeted conservative groups. There is also a reason that many establishment politicians in both parties have not necessarily given their full efforts to the investigation of the IRS. When an investigation of this sort takes years, it is a pretty good bet that someone does not want the investigation to succeed. One of the groups targeted by the IRS was True the Vote. I first became aware of True the vote and its founder, Catherine Engelbrecht, in September 2010 (rightwinggranny.com). The group’s effort was directed toward ensuring that the voting in Harris County, Texas, included only people who were entitled to vote. They have continued their efforts to ensure the integrity of American elections. Breitbart.com is reporting today that True the Vote has gotten involved in the recent Republican primary held in Mississippi. Republican establishment candidate Thad Cochran defeated conservative Chris McDaniel in a primary run-off election. Mississippi voting laws state that a person who voted in the Democrat primary election this year is not eligible to vote in the Republican run-off election. There are some real questions as to whether or not that law and other voting laws were enforced. True The Vote wants the federal judge to order the state party and Secretary of State’s office to allow independent verification of the election results to ensure there were no “illegal votes.” Such votes could come as fraudulently cast absentee ballots—the runoff saw a massive spike in absentees over the primary a few weeks earlier—or by Democrats who voted in the June 24 GOP primary runoff after having voted in the June 3 Democratic primary. Other potentially fraudulent votes could come from Democrats voting in the Republican primary who don’t intend to support the Republican they voted for on June 24 in November’s general election, though intent is difficult to prove. There are further allegations of vote-buying surfacing this week. This is the establishment Republican party fighting for its life against the Tea Party. Because the establishment Republican party has become almost indistinguishable from the Democrat party, they are losing votes as people are looking for an alternative party. Stay tuned. John Hinderaker at Power Line posted a story today about the testimony recently given by Catherine Engelbrecht before the House Oversight and Government Reform Committee. In nearly two decades of running our small business, my husband and I never dealt with any government agency, outside of filing our annual tax returns. We had never been audited, we had never been investigated, but all that changed upon submitting applications for the non-profit statuses of True the Vote and King Street Patriots. Since that filing in 2010, my private businesses, my nonprofit organizations, and family have been subjected to more than 15 instances of audit or inquiry by federal agencies. * In 2011, my personal and business tax returns were audited by the Internal Revenue Service, each audit going back for a number of years. * In 2012, my business was subjected to inspection by OSHA, on a select occasion when neither my husband nor I were present, and though the agency wrote that it found nothing serious or significant, it still issued fines in excess of $20,000. * In 2012 and again in 2013 the Bureau of Alcohol, Tobacco, and Firearms conducted comprehensive audits at my place business. * Beginning in 2010, the FBI contacted my nonprofit organization on six separate occasions – wanting to cull through membership manifests in conjunction with domestic terrorism cases. They eventually dropped all matters and have now redacted nearly all my files. I also refuse to let a precedent be set that allows Members of Congress, particularly the Ranking Member of the House Oversight and Government Reform Committee, to misrepresent this governing body in an effort to demonize and intimidate citizens. Three times, Representative Elijah Cummings sent letters to True the Vote, demanding much of the same information that the IRS had requested. Hours after sending letters, he would appear on cable news and publicly defame me and my organization. Such tactics are unacceptable. It is for these reasons that immediately after this hearing I am filing a formal complaint with the House Office of Congressional Ethics and asking for a full investigation. If we as Americans continue to elect people who engage in this sort of behavior, we will all eventually pay the price. This is a direct attack on someone who was attempting to insure that an election was honest, and they were attacked by the government. Is that the country we want to live in? Our political views on certain issues are somewhat affected by the area of the country and the particular place we live. I live in Massachusetts. Contrary to what some of our state officials say, there is a problem with voter fraud in this state, as well as in every other state of the union. It seems natural to me that voters would be required to show some sort of identification when they vote. You need to show identification to buy cigarettes, alcohol, rent a video, board a plane, and apply for welfare or unemployment benefits. If making people show identification would be a hardship for people who are poor, how do they collect their food stamps (which they are entitled to if they are poor)? When I asked my sister about this (she lives in Tennessee), she explained that in the past, excessive requirements had been put on black voters in the south, and many southerners were afraid that voter identification laws would be used to discriminate against minority voters. I understand, but I still think we need some sort of voter identification. 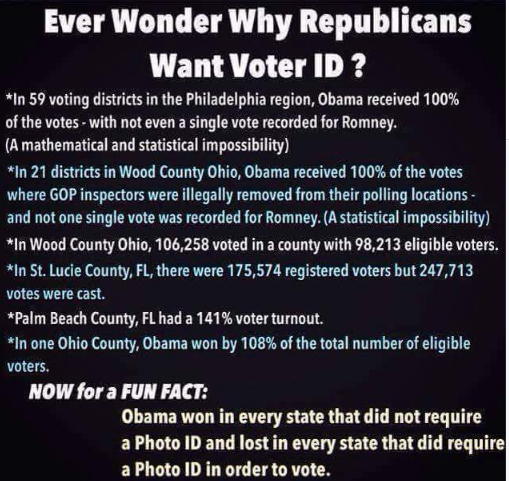 The good news here is that the public supports voter identification. At some point we can hope that our representatives will vote according to the desires of the people they represent.